Harry Kane or Christian Eriksen: Who holds the key to Tottenham's future? Ask the average football fan who is the one player indispensable to Tottenham and it'll be a poor bet on anybody returning an answer other than Harry Kane. And yet, with England's captain fantastic out nursing an ankle injury for over a month, other members of a Spurs squad that would make even the most ardent minimalist proud have stepped up. Heung-min Son has picked up four goals and two 'Man of the Match' performances since his early return from international duty to help carry Spurs through this tricky Kane-and-Dele-less period. The all-action, always-smiling live advert for Duracell is adored in his homeland and accompanied to every match by a travelling entourage of South Korean fans. Only Kane himself can boast of a larger social media following than the South Korean superstar. And yet, stripped of two of their most potent attackers for the past six games, the growing consensus among Spurs fans is that the 'Most Indispensable Player' title may well be segueing in another direction. Just as Tottenham's unlikely title challenge this term has gone largely unnoticed, the yearly contribution of quietly-spoken Danish international Christian Eriksen also tends to pass by with minimum fanfare, a reflection of the player whose online presence is so nondescript it is easy to confuse his official Facebook page (just 37,000 likes) with fan-made pages dedicated to the puppet master at the centre of everything Mauricio Pochettino's Spurs have done. Perhaps Spurs fans have forgetten just how long Eriksen has been at the club. Born and raised in the town of Middelfart, conincidently meaning 'Middle Way', in Denmark, Spurs submitted a typically last-minute £11-million bid for the Ajax youngster as part of the post-Gareth Bale windfall spending. Of the seven players signed to fill a Welsh-wizard-sized hole in the squad, only Nacer Chadli, Christian Eriksen and Erik Lamela can be looked at as justified investments by ENIC. Of these three, only the Dane went on to establish himself immediately in the team. The Argentine coach spotted Eriksen's talent the moment he walked through the door at Hotspur Way. In the 2014/15 season, Pochettino's first at the club, Eriksen was a near-constant presence on the pitch even as selections and formations were chopped and changed around him as the new manager struggled to settle on his best system. That year Eriksen would start a remarkable 37 out of 38 Premier League fixtures, his half-time substitution against West Ham United to replace Mousa Dembele ensuring that he featured in every single league game in a year that saw Spurs gamble heavily on youth to finish fifth in the league and reach the League Cup final. But the plaudits and hype that year were - understandably - heading in the direction of Tottenham's pool of young, eager English talent. Full-backs Kyle Walker and Danny Rose were improved versions of the mistake-riddled calamities they had been under Andre Villas-Boas. Dynamic, combative academy products Ryan Mason and Andros Townsend rose to the challenge with outstanding maturity and determination, and new signing Eric Dier was making a strong case for his name to be included in the Oxford English Dictionary's definition of the word 'bargain'. As if stepping out of that vast, highly-energised and slavishly-supported home-grown shadow wasn't enough to contend with, Eriksen's centrality to Pochettino's plans was almost completely hidden by the lens flare on England's new golden boy: Harry Kane. The first player to score more than 20 league goals since Gareth Bale and 30 season goals since Gary Lineker, Kane simply swept aside challengers and opposition defenders, going on to win the 2014/15 PFA Young Player of the Year award, earning a long-term contract and getting his first senior cap in an England shirt. A lot has changed since those early days of Pochettino's tenure - when winning trophies wasn't the be-all-and-end-all for every pundit on every sofa in every TV studio and the likes of Southampton, Swansea and Stoke were Spurs' main challengers for the top six. But amidst all of this, there have been three constants to this intriguing North London tale - Kane's goals, Pochettino's magic and Eriksen's unspoken centrality to the team's fortunes. It has, perhaps ironically, been the story of Eriksen's Spurs career so far. He has quietly gone about his business as chief architect while the headlines have gone elsewhere: To the debacle under Villas-Boas and 'Interim Tim' in his first season, to Kane and Tottenham's cadre of English youngsters in his second, to the supersonic arrival of Dele Alli in the third, to White Hart Lane's farewell and breaking of records in the fourth, and back to calendar-king Kane in the fifth. Yet the past few months have shown that Pochettino and Spurs can live without their talisman up front. In fact, if their recent 3-0 demolition of Bundesliga leaders Borussia Dortmund offered further insight, it is that they can in fact thrive without him. Ask most Spurs fans which player they are desperate to see sign a new contract and the answer is almost unanimous: Christian Eriksen. The difference between Spurs with the Kane-Alli attacking pivot and Spurs without that pivot is - based on recent hard-fought victories over Fulham, Watford, Newcastle and Leicester - a matter of winning by fewer goals. The difference between Spurs with Eriksen and Spurs without him is effectively an unbridgeable chasm. Synonymous with Tottenham's under-the-radar way of operating, the best of Eriksen often goes unnoticed. For those who watch him play, he is a non-stop metronome of activity; always on the move, searching and probing for the pockets of space from which he can wreak havoc. Perhaps his failure to score more than 10 league goals in any one season has overshadowed the fact that his passing accuracy hasn't fallen below 80% since he made the move to England, notching up 57 assists in that time - 6 more than his nearest challenger, Mesut Ozil. In terms of creating goal-scoring opportunities, only Eden Hazard has more to his name in a similar period. 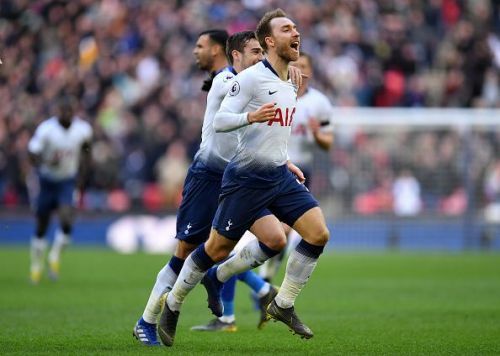 In the recent 3-1 victory over a stubborn Leicester side, Eriksen bagged yet another assist - making it 9 for the season, as well as a now trademark long-range howitzer to put Spurs 2-1 up. Since his arrival, no other player has scored more goals from outside the area than him (20 goals). Plenty of Spurs fans bemoan his apparent lack of desire to get 'stuck in' for 50/50 balls, pointing to the fact that his tackling rate has been plummeting year on year, from a staggering 87% in 2015/16, to a still respectable 78% in 2016/17, to a worrying 57% last season. But this misses the point of who Eriksen is or what Pochettino expects him to be. The same judgement and awareness that enables him to ping a 40-yard diagonal ball onto a sixpence will also guide his hand (or feet) in terms of which challenges he goes for, and which he does not. He doesn't challenge for balls that he doesn't think he can win, nor will he 'get stuck in' to a challenge when his footballing brain calculates too high a risk of injury or even risk of winning back possession but with nothing to then do with it. He simply doesn't do things for the sake of doing them, let alone for the sake of appearances. Is the Great Dane truly irreplaceable? And so, as the contract speculation rumbles on, there is a growing sense of desperation among Spurs fans that if the unthinkable happens and Eriksen departs in the summer, he will be as close to irreplaceable as is humanly possible. If anything, it is a minor miracle that the likes of Real Madrid and Barcelona didn't swoop for him years ago. The dilemma is that replacing a player of his talent and quiet influence would be a near-impossible task for Spurs with their current financial reach. Approaching the final year of his contract, it is unlikely Spurs will recoup more than £50-60m for the player. Replacing him with a player of similar quality would require close to £100m and Daniel Levy to remorselessly smash the club's carefully cultivated wage ceiling. And even if money were no object, there are but a handful of players in world football who could fill Eriksen's boots, and all of them already play for huge clubs and command vast salaries. It was Arsene Wenger of all people who recently equated Eriksen to former Spurs great Luka Modric, and in a sense he was spot on. When Modric departed to Madrid, Spurs didn't have a fool's hope of adequately replacing what he quietly but tirelessly brought to the team. And the common consensus is that in the seven seasons since, they never truly have; finding it easier and cheaper - albeit taking longer - to replace their entire system instead. Unsurprisingly, the player himself remains coy on the contract situation, with former player Jermain Jenas comparing the situation to Philipe Coutinho's move to Barcelona and claiming that Spurs should just bite the bullet and cash in, using the funds to 'build a better team'. But Coutinho had signed a new five-year deal at Anfield less than a year before Barca got their man, which allowed Liverpool to demand a sum that would cover their defensive rebuild courtesy of Allison and Virgil van Dijk. For Eriksen to depart in the middle of Pochettino's project would be a hammer blow to the manager. It is the Danish magician who is integral to his manager's spells more than any other player, having featured in a remarkable 169 out of the 178 league games played under the Argentine's watchful gaze. Even captain Hugo Lloris has appeared in fewer. Tottenham's signing of Eriksen back in that crazy summer of 2013 was sprinkled with a magical dose of karma. While still at the Odense Boldklub academy, Eriksen was flown out to London to have trials with Chelsea (twice). Fellow Dane Frank Arnesen liked what he saw but was concerned that the playmaker's slight physique wouldn't make the cut, and so advised Eriksen to go for a trial at Ajax instead. This was of course the same Frank Arnesen who had been poached (illegally) from Tottenham just a few months earlier by Roman Abramovich to become Chelsea's Director of Football. And so, ironically, Arnesen was unwittingly doing Spurs a favour. Whichever way this plays out, Spurs fans will hope and pray that the irresistible midfielder puts pen to paper and commits his future to the newly-rebuilt White Hart Lane. Without Kane and Alli, Spurs can get by - and adequately so. Without the Great Dane, they are lost. Tottenham: Harry Kane considering his future at Spurs? Will Tottenham's lack of transfer activity cost them dearly? Spurs' new stadium: Could a new era in Tottenham history be ushered in with move to new home?